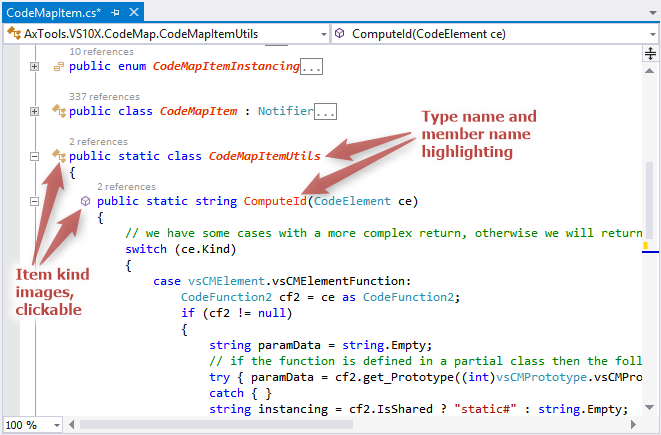 Enhance the code editor with class and member name highlighting, member type images, end-of-block details, hotspots etc. Visual Studio 2015 / 2013 Users: Please use Supercharger instead. It includes a much enhanced version of this tool plus a lot more, all based on a high performance, multithreaded parsing engine with almost zero UI thread overhead. VS10x Editor View Enhancer is a Visual Studio 2013/2012/2010 extension whose goal is to addnew visual features to the built-in code editor. 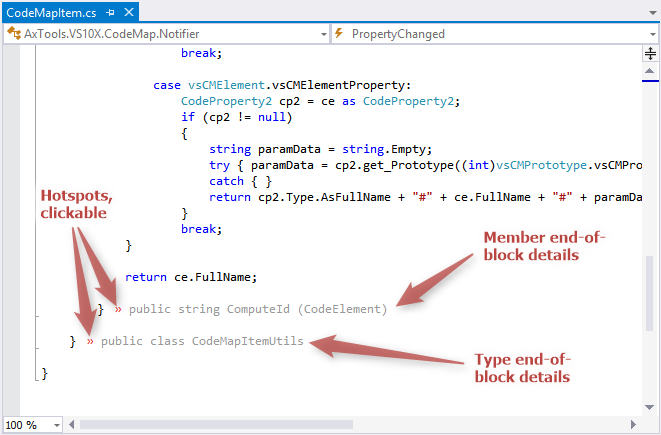 It currently features type and memberdefinitions emphasizing, end-of-block details, clickable hotspots (C# and VB documents). Pretty simple, but equally effective. At the end of type and member code blocks, ashort descriptive text (i.e. end-of-block detail) is added so that you can immediately notice to whom does that closing element (C# closing curly brace or VB closing tag) belong to. Also, a clickablehotspot is added for quick navigation back to the definition line of that type or member. You can customize the way definition lines are emphasized. You can control color, bold, italic, font size, font face and whether the distinctive image should be displayed or not. The Options dialog box can be accessed from the VS10x menu popup which can be foundon the main menu. Added options to control feature set availability per language. Fixed a problem in the 'Customize' dialog. Multiple 'VS10X' menu items were sometimes added to the main menu bar. Fixed an issue that was causing for all the Editor View Enhancer visual interface items to be cleared from the current code document during editing. Editor View Enhancer did not work properly with items in shared projects (i.e. in universal apps). Preliminary support for Visual Studio 14 (CTP). Relocated some common VS10x extensions code to a common lib. Sync release with other VS10x extensions. Update highly recommended. The member kind image was not correctly positioned on the vertical axis, especially visible with lines of bigger height. Improved dark theme detection logic. Clicking on the member kind icon opens a menu now instead of directly moving the cursor to the end of the member. Current menu actions are: go to end tag, cut, copy, delete, select. Custom foreground colors (i.e. for type and member names) were not persisted when using a dark theme. Fixed inconsistencies with default settings. Item kind images are now chosen depending on VS theme (i.e. light or dark). Type and member name highlighting is now theme-specific (i.e. it has separate default values and will store/retrieve separate values for light and dark themes respectively). Left-side images are now different for Visual Studio 2013/2012 and Visual Studio 2010. Selection is automatic. Left-side images were displayed at an incorrect y-coordinate in Visual Studio 2013 Ultimate. Sync release with the rest of the VS10x Extensions due to a common library being changed. 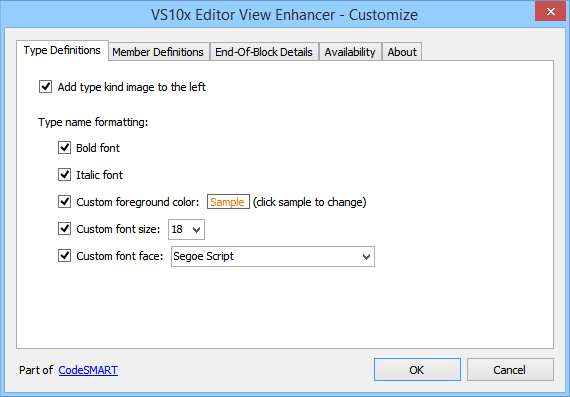 Setting changes in "VS10x Editor View Enhancer - Customize" take effect immediately (i.e. there's no need to reopen code windows or restart VS anymore). No need to restart VS for settings to take effect - reopening code windows will suffice. Delegates in VB code files were breaking Editor View Enhancer in-code highlighting. Editor View Enhancer nicely adjust its settings as global font options are changed by the user in the Visual Studio "Options" dialog. Fixed a situation when the code document could not be processed. Fixed a versioning issue, especially important to users having the full CodeSMART suite or other VS10x extensions installed. Fixed incompatibility issues with VS11 Beta. Preliminary support for VS11 (VS 2012?). Fixed UI elements scaling issues (when custom DPI settings were used) in the "Customize" dialog. Rebuild caused by a change in a VS10x common DLL. Clicking on a class/method image now navigates to the element end point. Thanks to Anthony Rose for the suggestion. More informative message on Customize dialog 'OK'. Extended the trial time with 5 more days since the earliest expiration date would have been on a Saturday. 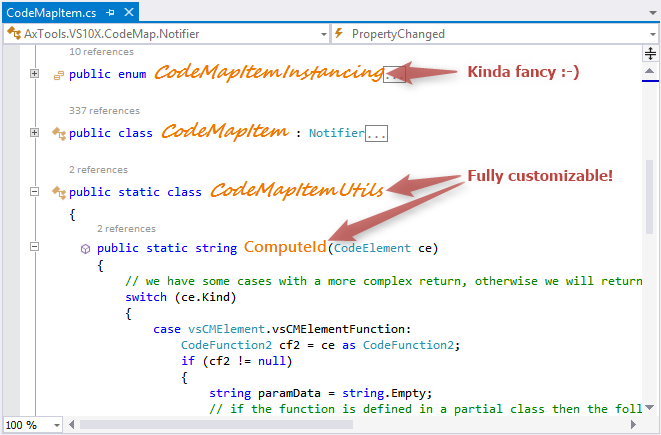 Editor View Enhancer did not highlight certain class/struct/enum names in VB documents. Speed optimizations when processing VB documents. Fixed some editor lockup conditions. Added a document line count limiter, i.e. if the document exceeds that line count, VS10x Editor View Enhancer will not process it. 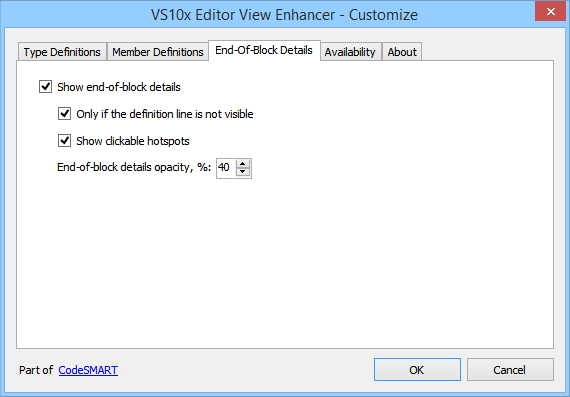 Default limit value is 20,000 lines (see the 'Availability' tab in the VS10x Editor View Enhancer options dialog). Added the option to show end-of-line-details only if the definition line of the corresponding code element is not visible (is outside the current viewport). Thus, code elements only a handful of lines long that are completely visible in the current viewport will not get an end-of-line detail. The description field in end-of-line-details is now more meaningful. FIX: Due to a bug introduced in the previous update, in some situations member and type name highlighting did not function anymore. Fixed an issue with a "trial expred" message. Fixed several issues where EVE did not correctly release resources. 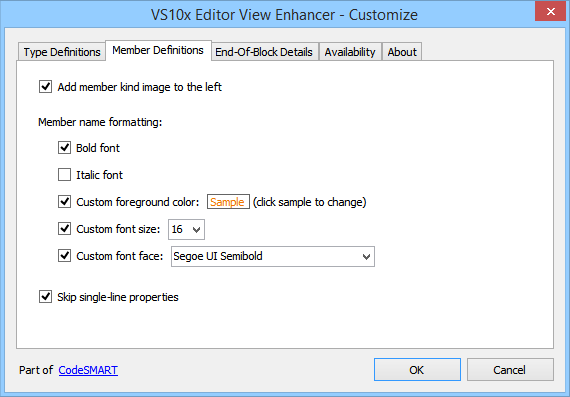 VS10x Editor View Enhancer participates now to the 'VS10x' menu entry on the main menu bar, with a 'Customize' option. Please note that the 'VS10x' menu entry is only available in contexts where there is a solution loaded. After a few minor versions where EVE was exclusively available in 'CodeSMART 10', we're back to public beta. Fixed: End-of-block details disappeared when deleting the last line of a code file. Some options were accidentally disabled in the Editor View Enhancer Options dialog. End-of-block details were sometimes not displayed from a certain position on. Fixed. Interface code elements did not have a type image displayed. Fixed. Fixed a problem where code files from projects contained in solution folders were not processed.